We are the leading Manufacture & exporters offer specially made sound absorption polyurethane foam with NRC (Noise Reduction Co-efficient) value of 0.8. 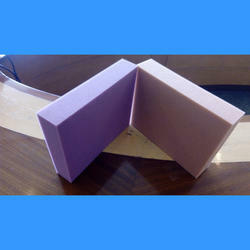 This acoustic absorption foam is known for their fire retardancy and sound absorption characteristics. The another advantage associated with this foam is that it can be easily glued to any other material such as non-woven fabric, sun mica, gypsum sheet, glass fiber. This foam can also be supplied in profiled sheet foam. These foams find their major application as sound absorber in theaters, public room, electronic data processing industries, automotive engine testing rooms, aeronautical and transport industry. uses sound insulation of building walls, sandwiched panel, dg set canopies, consoles etc. 30 furl grey 30+1 ul 94 / BS5852 sound insulation of building walls, sandwiched panel, dg set canopies, consoles etc. vr 45-100fr 45+2 ul 94/BS 5852 sound insulation of building walls, sandwiched panel, dg set canopies, consoles etc. 30 furl grey 30+1 UL94 /BS5852 sound insulation of building walls, sandwiched panel, dg set canopies, consoles etc. vr 45-100fr 45+2 UL 94/BS5852 sound insulation of building walls, sandwiched panel, dg set canopies, consoles etc. Speciality Foam for mattresses and Upholstery comes from the vast product basket of Sheela Group.These Foams conform to RoHS REACH Standards. 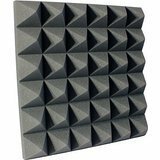 Application of PU Acoustic Foam (Egg carate PU Foam) Perfect for studios, recording studios, vocal booths, control rooms,Sound proof Room ,home theaters, professional movie theaters, concert halls, gymnasiums sports centers, auditoriums and more. One of our thickest panels yet. Please note this item is for lowering sound reflections in a room and not absolute sound deadening. 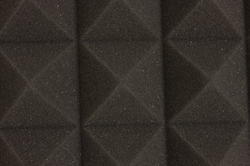 This PU foam provides moderate sound control on walls or ceilings. Dampens and diffuses sound waves inside of a room to minimize interference, Increases increasing sound clarity. We are the leading Manufacture exporters Our Sound Insulation Foam is innovatively designed such that it can easily glue to other material. 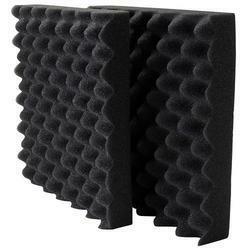 The excellent sound absorption property of this foam makes it ideal for sound absorption applications. This foam has noise reduction co-efficient value of 0.8, making it perfect for sound insulation applications. We offer these foams in profiled sheet form or as per the specification of the client. This product is available in following grades specifications. vr 45-100fr 45+2 ul 94 / BS5852 sound insulation of building walls, sandwiched panel, dg set canopies, consoles etc. We are the leading Manufacture & exporters Our Sound Insulation Foam is innovatively designed such that it can easily glue to other material. 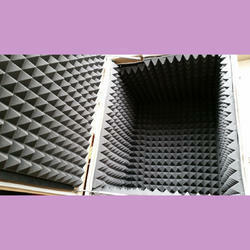 The excellent sound absorption property of this foam makes it ideal for sound absorption applications. 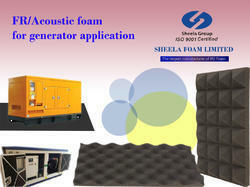 This foam has noise reduction co-efficient value of 0.8, making it perfect for sound insulation applications. We offer these foams in profiled sheet form or as per the specification of the client. This product is available in following grades & specifications. This light weight P.U Foam is a high performance sound barrier and meets self extinguishing fire rating as per UL-94 .The different product combinations efficiently handle low ,mid and high frequency ranges of sound energy. Specially made for applications where fire retardancy and sound absorption characters are required ,it is convoluted in various shapes to attain higher efficiency levels. These forms are specialty made for special application wherein fire retardancy and sound absorption characteristics are required. The foam has NRC (Noise Reduction Co-efficient) value of 0.8. This can be easily glued to other material such as non-woven fabric., glass fiber, sun mica, gypsum sheet etc. by means of glue. This foam can also be supplied in profiled sheet form.